The annual BoS Conference in Boston is one Escapees anxiously await. Not for the hustle and bustle of historic Boston, not for top-notch educational institutions that are scattered around town, and not even for Boston’s rich culture of museums and ethnic restaurants, but mostly for the inspiring professionals in the software industry that the conference attracts. It was a long haul and four days out of the office (thank you Escape!). So, I was feeling the pressure of innovation that I would be expected to absorb from the brilliant minds presenting at the conference, then implement at Escape. I like precision, so my strategy was to absorb as much as I could, but remain focused on one thing. If I could dramatically improve one thing, what would it be? The answer came to me after a brisk walk during my lunch hour. I will focus on ideation and design of new features so we can continue impressing our users. I quickly registered for the Design Origami workshop, and packed my bags. 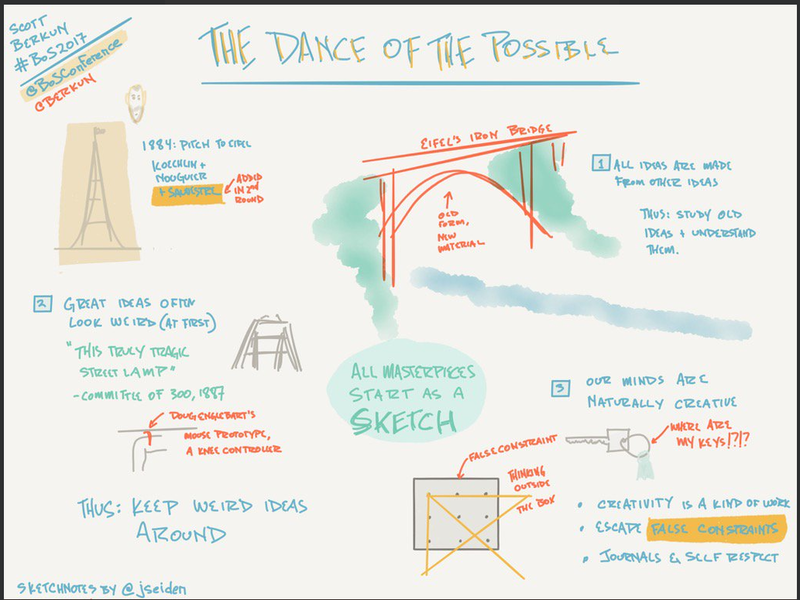 The session I found most relevant to my focus area was The Dance of the Possible presented by Scott Berkun. It was so refreshing that I had to read the book on the flight back home. Based on the session, the book, the workshop, and my own life experiences, here are some takeaways that I hope to use to help teams become better at generating ideas, turning them into products customers love. Humans are naturally wired to be curious and creative - embrace it! Don’t expect efficiency when you are being creative. Creativity and efficiency will never be best friends – accept it! Remember that you will need to be brave to explore uncharted territory - be ready to be uncomfortable! Creativity takes time – schedule it! How often do you hear a coworker, a child, or a spouse say in frustration, “I’m stuck!” and how often do you lack ideas for projects, blogs, or even simple things like birthday presents for your significant other? So where does creativity come from? Dark closets, brisk walks, warm showers, and sometimes even boring design meetings (not that we ever have those at Escape). It comes from your subconscious mind, which is best at generating ideas when your brain is at a relative rest and your body is either performing a repetitive activity (knitting) or a physical activity (running and trying to escape the dark closet). Start often. Start jotting down ideas, observations, and inspirations in an idea notebook. Accept that you may need to deviate from the original concept since mistakes are inevitable. When developing a concept, make sure you know what problem you are solving and define it. Group ideas in meaningful ways. Write a rough draft or sketch it. Define the goal - when you are done, how will you know your work was successful? Research your idea. Remember that all ideas are made of other ideas. Research if a similar product already exists. You may need to abandon some parts of your idea and try to get more ideas. Show the concept to a coworker, friend, or customer and ask for constructive input. Decide on which ideas you want to spend your time. Often times we are limited by constraints (time constraint for a blog, budget for a project, etc. ), so you will need to prioritize your ideas. The effort gap - Are you willing to put the effort into making your idea a reality? Discipline yourself to work on your project every day (even if it is for half hour a day). The skills gap - Do you have the right skills to deliver on it? Research and ask people who are subject matter experts in this area to learn more. The quality gap – What if customers don’t find the product helpful? Consider getting customers involved as early as feasible to get their input. Open your mind to constructive feedback. Use feedback as an opportunity to improve your idea/product. So next time you feel stuck or need a boost of creativity – give these ideas a try (ok, maybe not the dark closet! ).